League leaders Market Rasen Town Under 16s fought back to gain a point at promotion rivals Healing. Third-placed Healing have games in hand and are one of the few teams left who could pip Rasen for promotion, and the hosts looked up for the challenge from kick-off and made Rasen look poor in the early exchanges. Healing controlled the game and took a deserved lead through a well-worked move down the left to put pressure on the visitors. This seemed to fire Rasen into action and they began to play the brand of football which had taken them to the summit. Just before half-time, Joe Robinson’s through ball left Tom Robinson one-on-one with Healing’s keeper and his powerful finish found the bottom right corner to level the scores. Rasen came out with fire in their bellies for the second half and dominated, reducing Healing to one meaningful attack in the 40 minutes. But resolute defence meant there were no goals in the second half and both teams took a point. Town’s man-of-the-match was Alix Philizot who was playing his first game in Rasen’s back three, standing in for the injured Dominic Brown, but looked like he had played there all season. 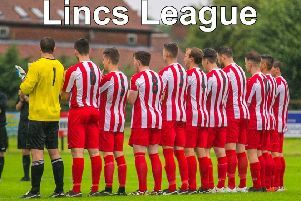 The draw left Rasen four points clear with just two games left to play. Manager Brian Inman said: “That was as tough as I expected. I’m very pleased with our second half performance. Local rivals Welton visit Rase Park on Sunday. Welton also have games in hand and could mathematically finish above Rasen, but victory for the hosts could go a long way to guaranteeing promotion. Kick-off is 10.45am.